Phil Houdlette just wants his Richmond boys basketball team to see the place. The Bobcats will take the court at the Augusta Civic Center on Wednesday as part of the Capital City Hoops Classic, with an exhibition game against Nokomis scheduled for 9 a.m.
They’re hardly strangers, having played at the ACC five times since the summer alone. But their coach knows a sixth time won’t hurt. “I think anytime you get to play in the Civic Center is a plus,” said Houdlette, whose team played three games there in July and two more in November. “Just playing the competition and actually getting on the floor, because it’s a little bit bigger and the venue is different, the basket has a wall behind it. That’s the major benefit of playing in the tournament for the 36 boys and girls basketball teams that will flock to Augusta for the Classic, which will feature nine games starting at 9 a.m. and going until 9 p.m. both Tuesday and Wednesday. As one of the host sites for the state championship games, the Civic Center is a key part of the Maine basketball landscape, and teams know the value of getting a chance to see in December a place to which they’ll hope to return in March. Many teams will surrender a home game because 13 of the 18 games are regular-season games that will count toward the Heal point standings. Starting on Tuesday, those games are between the Rangeley and Forest Hills girls and boys (9 and 10:30 a.m., respectively), the Madison and Mountain Valley girls (noon), the Boothbay and Mt. Abram boys and girls (1:30 and 3 p.m., respectively) and the Deering and Bangor boys and girls (4:30 and 6, respectively). On Wednesday, the counting games will be between the Messalonskee and Mt. Blue boys (1:30 p.m.), the Cony and Lewiston girls and boys (3 and 4:30, respectively), the Skowhegan and Erskine boys (6), the Gardiner and Brewer boys (7:30) and the Winthrop and Dirigo boys (9). There will also be exhibition games Tuesday between the South Portland and Greely girls (7:30 p.m.) and Gorham and Winslow girls (9) and Wednesday between the Richmond and Nokomis boys (9 a.m.), Hall-Dale and Mountain Valley boys (10:30) and Cheverus and Lawrence boys (noon). It’s a frantic schedule, but one filled with compelling and talent-rich matchups. The Deering and Bangor boys game will showcase a pair of Class AA teams, with Deering (3-1) enjoying a strong start after reaching last year’s North regional final. Dirigo’s and Winthrop’s game will be between a team that reached the Class C championship game last year in the Cougars and one that’s a favorite in the class this year in the Ramblers (4-0). The showdown between Brewer (3-1) and Gardiner (2-2) could loom large when teams are jostling for seedings late. And though it’s an exhibition, the South Portland and Greely girls contest will feature two of the top teams in the state. The day also sets up for intriguing intra-class matchups. Cony’s and Lewiston’s game matches an A team in the Rams with an AA team in the Blue Devils. Cheverus and Lawrence will be another AA-A contest. And when Nokomis and Richmond play, it’ll be the 3-2 and Class A Warriors facing the Class C but 6-0 Bobcats. 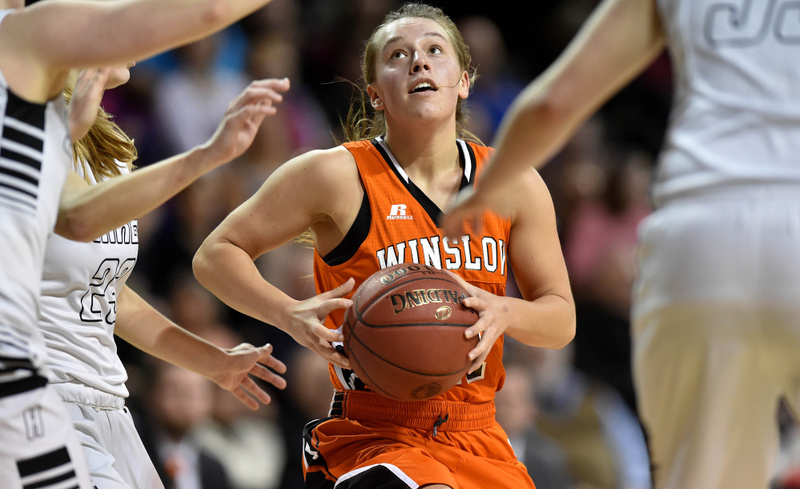 And on the girls side, Class B Winslow’s opposition will be as good as it gets. The Black Raiders (3-1) will see a Gorham team that won last year’s AA title, has jumped out to a 4-0 start this year and has arguably the state’s best player in Villanova-bound Emily Esposito.